The evil Mr Big has escaped from prison again and he's on a mission to steal Egypt's most valuable treasure, The Nile Ruby. The Prime Minister knows only one agent can stop this evil criminal mastermind - Spy Dog! But can Lara learn some new tricks in time to find the ruby, protect her Pups and get Mr Big back in jail where he belongs? Book 9 in the Spy Dog adventures - now a number 1 bestselling series! Spy Dog, aka Lara, isn't the only Mummy around...National security is under threat! The evil Mr Big has escaped from prison again and he's on a mission to steal Egypt's most valuable treasure, The Nile Ruby. The Prime Minister knows only one agent can stop this evil criminal mastermind - Spy Dog! But can Lara learn some new tricks in time to find the ruby, protect her Pups and get Mr Big back in jail where he belongs? Praise for Spy Dog: "An imaginative, creative feast". (Radio Times). 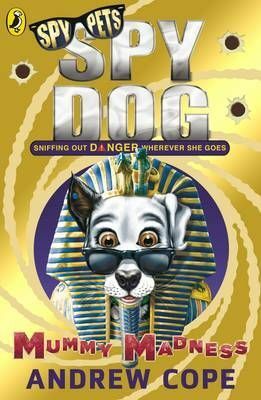 Spy Dog - winner of the Richard and Judy 7+ developing reader category, and the Red House Children's Book Award.